It's Tuesday and the kids tried Orzo Stuffed Peppers. This wasn't the first time for Mark & I as I have made them before but the kids wouldn't have anything to do with them. Tonight was different (or was it...do you count bribing with Oreos?) 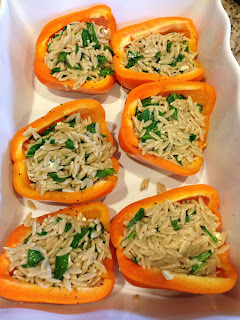 and they actually liked them...the orzo better than the peppers. Cook orzo according to package directions in salted water; drain. Return to pot and add above ingredients plus 1/4 tspn each salt & pepper; stir. Super easy and can make ahead! These look oh so yummy! I am going to give it a whirl. I have been in a cooking funk lately and need a new recipe. Thanks, girl!